Hello! My name is Tano Bongiorno and I would love to be your host and tell you about all the exciting happenings going on in and around this ancient city. today I’m gonna tell you about The Botanical Garden and the Villa Giulia in Palermo. Did you know people were living here in prehistoric times? Palermo has seen many wars, occupations, and upheavals over the centuries, but we are still here. Of course, we are more civilized today than they were in prehistoric times. Well, a little more civilized anyway. What can I say? Some people never grow and change. There are too many sites, restaurants, shops and especially open markets for me to talk about all of them, so today I’m gonna tell you about The Botanical Garden and the Villa Giulia in Palermo. You will find that The Villa Giulia rightfully boasts one of the most important beautiful public gardens in all of Palermo. Tourists always find this a most welcoming locale where they can relax for a while and give the children a safe place to run and play. The Orto Botanico serves two purposes. It is not only a lovely botanical garden, but at the same time the Department of Botany of the University of Palermo makes good use of the facilities for research and educational purposes. Villa Giulia and the botanical garden will seem an exotic faraway place upon your arrival in these enchanted gardens. Perhaps you will feel as did Hercule Poirot who found this a perfect location for lovers of peace and reading. Of course, Signor Poirot never can resist a mystery, so he seldom finds much time for peaceful reading. The botanical garden was designed by French architect Léon Dufourny in 1789. And for only a few euros you can enjoy a relaxing day listening to the soft background music of chirping birds. 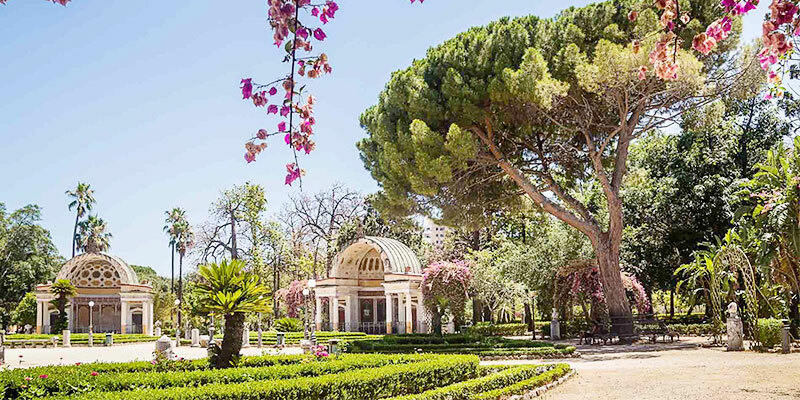 This botanical garden is indeed the most important and beautiful garden in the entire city of Palermo. However, management might be a little more intensive. What can I say? It is my private opinion that if the plants could speak, they would rain Sicilian insults (and there are plenty of these!) like hail on the staff and the municipality. Well, instead of saying, when in Rome, do as the Romans do, I say, when you visit the gardens, just do as I do and try to pretend that everything is clean and orderly so you can get the most enjoyment out of your visit. When you enter the gardens, staff gives you a map clearly indicating all the garden sections. There is the Linnaean classification selection, the Engler classification selection, and a bio-ecological and geographical section. Many useful plants, water systems, a greenhouse, an experimental field as well. The experimental field features medical plants, a tropical orchard, a palm grove, and historical collections. It is my duty as your guide and host to point out to you that there is only one vending machine. This is by the entrance so it would be wise to buy a bottle of water and perhaps a snack before heading off down any pathway. The botanical garden is huge. It covers some 100,000 square meters (That is almost 25 acres), and houses over 12,000 different species. Among these, the gardens boast the largest Ficus macrophilia in all of Europe, a sight that evokes a vision of a creature rising out of the abyss to burst through the surface. As you stroll about in the gardens you will realize there is something very magical in the scents that make you forget you are standing in the center of a polluted city. Since the park is divided into different sectors, you may stroll at your convenience. You should find the medicinal and aromatic plants interesting. These are known for their uses in pharmaceutical, cosmetic, and even in the culinary fields. And to miss a visit to the aquarium and its giant tank would be a pity. It is home to lovely water lilies and turtles. Villa Giulia, like the Orto Botanico, has unfortunately been poorly maintained, but as we say here in Sicily, “The best description is the one you don’t make.” In other words, sometimes it may be better not to express an opinion. If some detail or smell offends, just close your eyes and enjoy seeing this stunning product of nature. When you visit the oldest garden in the city, you may feel it came right out of a Peter Greenaway movie. Praetor La Grua ordered construction of the garden way back in 1777. This is just beside the botanical garden, only separated by a gate. Among the many objects of charm is the solar clock designed by mathematician Lorenzo Federici. No matter where you go, you will find things are never quite what the brochures and photos try to tell you. When you go to some restaurants you may see beautiful and mouth-watering photographs of dishes or sandwiches, but when you order yours, you think, What in the world is this? Tourism is something like that, and the Botanical Gardens and Villa Giulia are the same. They are not perfect, but you have to take the good with the bad, and here, you may take it from Tano Bongiorno, the little bad here is nothing compared to the wondrous beauty you will find at the Botanical Gardens and Villa Giulia. Here you will find yourself immersed in real and exciting nature. As an additional bonus, you may admire the numerous marble sculptures. The most significant is the Genius of Palermo which was finished in 1778 by Ignazio Marabitti. 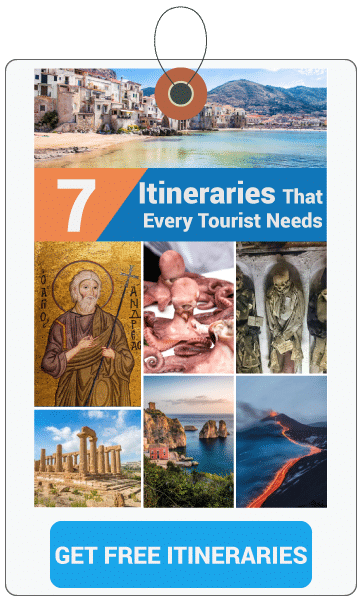 Enjoy your visit and tell them Tano Bongiorno sent you!